Preventive dentistry is an act of cooperation between Dr. Catherine Cech, our dental team, and you, the valued patient. This care has one important purpose in mind – to help you preserve your beautiful, natural teeth and their supporting structures by treating potential dental infections and damage at their earliest stages. This goal starts at home with the help of strong oral hygiene techniques and a balanced diet and is continued by our team’s professional efforts, including services like routine dental check-ups, professional hygiene, digital X-rays, fluoride, dental sealants, and much more. Prevention is the key towards enjoying a smile that stays strong, functional, and confident for life! Patients from Sandgate, VT and surrounding areas are encouraged to contact us today and schedule an appointment. We’ll take X-rays in order to view your unique mouth in perfect detail and identify problems that can’t easily be viewed on the surface, such as bone loss, decay, and any possible tumors or cysts. 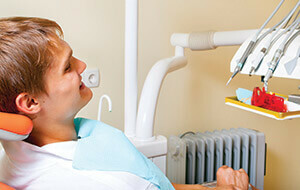 X-rays are also very helpful when identifying the exact positioning of certain teeth and roots for treatment purposes. Our Manchester, VT practice is happy to offer digital X-ray technology for more patient convenience and comfort! We’ll perform an oral cancer screening, inspecting the face, tongue, soft oral tissue, lips, neck, and throat for common signs of this dangerous condition, such as red or white patches or sores that easily bleed. We’ll perform a periodontal screening, checking the gum and bone located around the teeth for tell-tale indications of periodontal disease. We’ll inspect each tooth with the diagnostic power of DIAGNOdent! This advanced laser helps us detect decay at its earliest stages, even before it’s visible on the surface of the tooth. This allows Dr. Cech to keep your care as conservative as possible. Calculus (also commonly known as tartar) is a hardened deposit of plaque that’s attached itself to the teeth. Because calculus resists removal with traditional brushing and flossing and can be located both above and below the gum line, our staff will use special tools to get rid of it effectively. The sticky, bacteria-filled film known as plaque is also cleared away from your teeth and gums in order to prevent decay and infection that can lead to periodontal disease over time. Finally, we’ll polish the teeth to remove any minor stains that have remained. Sportsguards are designed to “guard” your vulnerable teeth and gums from harm when participating in an athletic activity that could involve contact with other people or objects. Dr. Cech also often recommends similar oral appliances for children and adults who struggle with teeth grinding and/or TMJ concerns, which is discussed in more detail below. If you or your loved one is in need of a sportsguard, please consider reaching out to our practice for help instead of simply grabbing one off the shelf at the store. We can provide an appliance that’s designed with your unique smile in mind, providing additional comfort and freer movement. In addition to protecting the mouth, did you know that sportsguards can also reduce the amount of force that’s transmitted from the impact of the injury (the jaw) to the patient’s central nervous system? This reduces the risk of severe concussions and traumatic brain injury. Tooth decay is a serious problem, especially for younger patients who are still learning how to properly care for their growing smiles. That’s why Dr. Cech recommends dental sealants as an effective preventive measure. This tough material is painted onto the chewing surfaces of back teeth, also known as a prime target for food accumulation and dangerous bacteria. By “sealing” this area shut, we can bolster the mouth’s natural defenses and help reduce potential damage in the area. This service is most effective when used in conjunction with other important preventive measures, such as attending a routine check-up and cleaning every six months and brushing and flossing at home. On average, one person dies from oral cancer every hour. Even scarier is the fact that a whopping 25% of those people didn’t participate in any risk factors for the disease, and many cases go misdiagnosed or not diagnosed at all every day. That’s why Dr. Cech treats the diagnosis of oral cancer as a top priority. By making an in-depth screening a vital part of every regular check-up, our team can draw attention to tell-tale symptoms and help patients take the next steps towards treatment. Fluoride is an important mineral that’s found in many water supplies and food items, helping both developing and adult teeth become stronger by remineralizing tooth enamel and reducing the threat of demineralization. Many people receive enough fluoride in their daily lives – however, those who don’t may need a little extra help from our Manchester, VT staff. Dr. Cech often recommends fluoride treatment for both younger patients and adults who have teeth that are oversensitive to decay. Dr. Cech enjoys welcoming children to her Manchester practice, and she and her team have a lot of experience when it comes to providing safe, fun appointments that leave them feeling right at home. We’ll provide in-depth check-ups and gentle cleanings, always keeping an eye out for potential developmental problems so that they can be addressed as early on as possible. Dental sealants, fluoride treatment, and other preventive services are available as well to protect and strengthen their growing smiles. The team’s goal is to have young patients leave feeling happy and looking forward to their next appointment. Our dental team’s goal is to help patients enjoy a beautiful, healthy smile that lasts over the span of their entire lives. In addition to professional care, though, a patient’s personal oral hygiene routine at home is a most important factor. Based on need, our hygienist will customize home care instructions and product recommendations. “Occlusion” is defined as the way that a person’s upper and lower teeth/jaws interact with each other. Dr. Cech has undergone additional training in this area of dentistry, and she will perform an occlusal assessment on all of her new patients to ensure that everything is working as smoothly as it should. Sadly, problems with occlusion can be common in our society – in fact, studies show that nearly 80% of the population struggle with bruxism (more commonly known as teeth grinding and clenching). Over time, this condition can lead to dental and TMJ (temporomandibular joint) irritation/damage, as well as excessive jaw/facial pain. If Dr. Cech identifies a problem with your occlusion, there are multiple options moving forward. She may provide an oral appliance (also known as a mouthguard) that protects the teeth and minimizes damage caused by bruxism, if present. This device might also be needed to preserve the improved function and beauty of restorative dental work. Occlusal adjustment can additionally be provided in order to better harmonize your bite. In some cases, Dr. Cech may recommend patients to an orthodontist or other specialist in the area who can provide additional assistance in achieving relief.